Not since the days of Michael Stackpole’s Rogue Squadron have I read a Star Wars comic, but with the recent release of Brian Wood’s Star Wars my interests were once again piqued. I saw that this week’s releases included a new number one issue, so I thought I would check it out. When I first opened this book I noticed there was a recap page. Alarm bells started to go off in my head. This is a first issue. Am I going to be missing something? Wait. The movies all start with recaps of recent events, so maybe this is homage to that. As I read through the issue I felt like there was a lot of backstory that I was missing. The center character here is Jedi Master K’kruhk. It was obvious from the recap page and the title (Dark Times) that the Master K’kruhk has been having it rough since the Emperor and Vader came to power. There were a few casual mentions to this, but were quickly brushed away. I didn’t really get any sense that there was inner turmoil within K’kruhk. I came away from this issue not really caring about any of the characters. They are Jedi running from the newly formed Galactic Empire and that is a pretty sucky situation to be in, but there failed to be any sort of emotional connection made between reader and the characters. 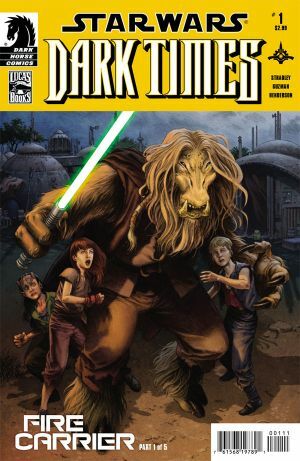 I felt like I was missing something, so after a quick Google search, I came to find out there have been over twenty issues of Dark Times stories. Perhaps if you have read those, then you might have some love for these characters. As a new reader picking up a first issue, I didn’t get that. The story for the most part focuses on K’kruhk and his ragtag group of braidless padawans settling into a refugee camp. There are a few small happenings around the camp, but nothing that felt particularly necessary or impactful. By the end of the issue K’kruhk ‘s old master makes a visit and tells them bad things are coming! As a cliffhanger I found it rather weak. Throughout the issue K’kruhk mentions that he has a feeling that they need to leave the camp, because bad things may be coming. I imagine that Vader or one of his lackeys will be hunting the group down in the future. Without any intriguing characters to draw you in, it feels like a rather formulaic and bland story. The one part of the issue I did enjoy was the page showing a newsreel of Vader fighting the good fight. It was nice to see a familiar character, but Vader’s roll was rather limited in this issue. He has one of underlings working on a secret project of some importance. This brought some further frustrations to me. It feels like all the important stuff is happening outside of the comic! Star Wars Dark Times: Fire Carrier is a pass. For a first issue the characters do almost nothing to get you to like them, nor do they do anything to evoke a negative response either. The art was slightly nostalgic of the yesteryears of Star Wars comics, but it was not enough to save a slow uneventful comic. It’s Confirmed: Gail Simone off Batgirl!